'Boulez's first concert in Moscow with the BBC Symphony Orchestra was unforgettable. Nothing of the Second Viennese School had been heard there since the early 1920s, and he conducted Webern's Five Pieces for Orchestra, Berg's Wozzek fragments and Altenberg Lieder and his own Eclat. All the young Soviet composers were sent to a mythical conference in Kiev to keep them out of the way, but Oistrakh sought me out and took me to a box at the back of the Conservatoire Hall, where behind a curtain sat the ashen-faced Shostakovich. I asked if he would give me an interview. Blue around the mouth and with shaking hands he refused, but he was not at all unfriendly. I did not ask what he thought of Boulez's music, but he told me how much he admired his conducting of Berg'. 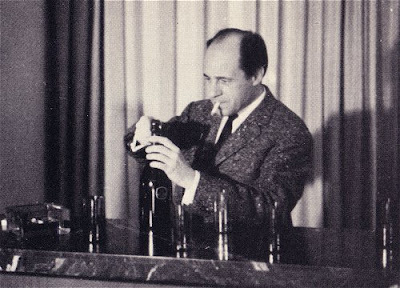 Delightfully informal header photo shows Pierre Boulez at the bar of his house in Baden Baden. Image credit from Joan Peyser's out of print but well worth getting hold of Boulez - composer, conductor, enigma (Schirmer ISBN 00287117007); Shostakovich merits just one mention in the book's index, Berg receives eighteen. Book quotation from Tainted by Experience by John Drummond (Faber ISBN 0571200540, also out of print). More priceless Drummond here. But according to John Drummond Shostakovich rated Boulez more extra virgin than third-pressing. Excuse me? How does that conclusion follow from the Drummond excerpt you quote? From that quote, I'd say S rated B's music something less refined than third-pressing; something (literally) unspeakable, in fact. There was actually a double entendre in my use of 'extra virgin, but it clearly didn't work. Can other readers provide facts on Shostakovich's opinion of Boulez's (or other contemporaries') music? I believe Shostakovich's letters may contain the answer, but I don't have them to hand. I can't resist boring you with another anecdote, this time about Tippett, prompted more, I guess, by the linked-to post "Puffery and Closed Mindedness". But also about my late, beloved uncle Jack Wars who was a great supporter of the Sydney Symphony Orchestra and about whom there are a huge number of stories. But they can wait for another time. Anyway, Uncle Jack was on the Opera House Committee which functioned during the construction and opening phases of the SOH. As such, he was privy to all the accoustic test results of the Concert Hall and as a result booked a block of seats in the middle of Q row in the stalls. This is the accoustically "sweet" spot of the hall. My family still retains these seats, as they're worth their weight in gold. Q row is also where the critics sit, and until a few years ago were where special guests would be seated, especially composers present at performances of their works. That practise is no more, because composers are now placed in acoustically inferior seats on the aisles and closer to the platform. So that's why one evening I found myself sitting next to Tippett at a performance of the Piano Concerto. I can't find with a quick Google when this took place -- 15 or 20 years ago I imagine. The advertised, famous, soloist had had to cancel, and so a local boy (sorry, can't remember who) filled in. I'll never forget the "Oh GOD!" from Tippett when the pianist placed music on the piano's music stand. "Don't worry," said the ABC minder sitting on the other side of Tippett, "he does a good job!" Thereafter, Tippett winced and moaned his way through the whole piece, in a profuse sweat, hating every note. What a relief for everyone in the vicinity when he got up to take his bow! I really hope he enjoyed other performances of his music a great deal more. Naturally, I hadn't the chutzpa to ask him to autograph my programme.